I am a baker. I absolutely love to create in the kitchen, and share with my friends and family. Although, sometimes I find myself in a rut and making the same things over and over. This can get pretty boring. 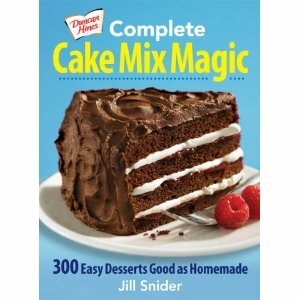 When I had the chance to review Complete Cake Mix Magic by Jill Snider, I thought it would be a great opportunity to try out some new ideas! There are 300 ideas in the book - covering cakes, muffins, cookies and frostings....what more could you need? Jill Snider has decades of baking experience, including 25 years as the Test Kitchen Manager for a major flour maker. In addition to being a bestselling cookbook author, she's a highly-respected food stylist and recipe developer. Jill lives in Toronto, Ontario. The ideas are simple and use boxed mixes - they may have a few extra ingredients, but if you're a baker - you probably have everything you need right in your cupboard! Even if you're not experienced in the kitchen, it should be no problem for you to follow the step by step instructions that are laid out for you. As I flipped through the book, everything looked amazing. However, the first recipe that REALLY caught my eye was the Chocolate Peanut Butter Tower. It is a 4 layer chocolate cake layered with peanut butter icing and chopped up peanut butter cups. You frost the cake with chocolate peanut butter frosting - what more could a PB and Chocolate lover ask for? That sounds like my husband's dream come true! He's a big PB & Chocolate fan! I never ate PB as a kid and I didn't eat chocolate until after I had my kids. Now, I can't get enough! That recipe sounds amazing! Neat idea!! I like to bake but very frequently resort to a box. This would make the box more fun! Hmmm I've never seen this book, which is surprising. I was actually just in the baking section at Chapters the other day and didn't come across it. Baking is my thing too :) I'll have to see if I can find this somewhere. Oh my gosh - that all looks delicious! Love the fact that it uses boxed mixes...certainly saves a lot of time that way! I am a lousy baker... but I'd feel comfortable giving this one a shot as it's based off of box mixes. Cool idea. This looks like a fabulous book.. I am also a cook/baker and would love to try this out myself.